Sue has worked at Hire Plants since 2001. 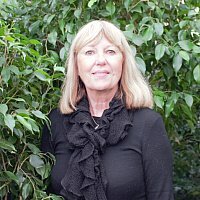 Sue’s industry experience, knowledge, supplier, and in particular customer relationships prove a valuable asset to customers in meeting their needs, sourcing products and ensuring plantscapes are well designed and sustainably matched to their environment. Sue is herself a passionate and creative landscaper having displayed her own home in the Hero Titirangi Garden show.